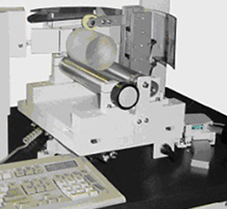 Delta Technologies has over forty years of experience building high precision, production grade X-Ray goniometers for determination / orientation of crystalline structures. Delta's manufacturing program includes standard and custom applications for as-grown and shaped single crystals. The machines are easy to operate and have a high degree of accuracy and repeatability. SlicingTech is the exclusive US distributor of Delta Technologies (SECASI design) X-Ray equipment. 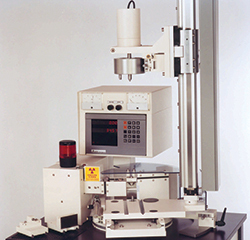 – GM Series model with stainless steel vacuum holder for wafer face measurement up to dia. 200 mm. Degrees, minutes, seconds: 1 or 5 sec. PC and software: decimal and deg.min.sec. Standard or customized software. Storage of measured data. Based on the widely used DELTA GM series X-Ray system, this equipment incorporates the same general features as the standard units. However, in specific configurations for operation on a dedicated crystal and plane, it becomes an extremely accurate measuring instrument. 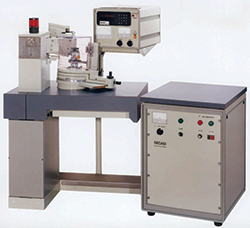 Window type vacuum holder enables repeatable positioning of the wafer to be measured. Spring loaded pusher is supplied for holding larger samples. Contact us for information on equipment capability with other crystal and planes. The GM.SI series X-Ray orientation systems are designed for operation in combination with grinding equipment. The flat or notch orientation position found on the X-Ray machine must be transferred to the grinder. Several orientation transfer configurations can be offered to suit most grinding and ingot holding systems. Description of various procedures on request. Mixed dual-station versions, with GM or GM.WS station as a second station. Orientation process : ± 0.03 to 0.05°, depending on configuration. The software performs the orientation calculation in such a way that the ingot remains horizontal on the saw work holder. The operator is guided by the software during the orientation process. Locks inhibit process progress until proper action is taken. Mixed dual station versions, with above GM or GM.SI station as a second station. Pressure device enable perfect and repeatable ingot positioning. Capacity of model shown: 2" to 4". Length 200 mm. Contact us for information on equipment capability with other crystals and planes. After proper orientation, the ingot will be glued "on-orientation" on the wire saw work holder, to be cut. In order to match the orientation accuracy obtained with GMRD.WS system, the GS series gluing station* can be supplied in a high accuracy configuration, enabling production of as-cut wafers with extremely high orientation tolerances. Gluing accuracy with respect to saw work holder reference: 0.005 to 0.001°, depending on ingot length. *Data sheet and detailed process description available on request. Face of quartz blanks, bars and of any crystal requiring high orientation accuracy. PC and software: decimal and deg. min. sec. Standard or customized software. Storage of measured data.